When using a Venn diagram to write a compare and contrast essay, first draw two large circles. These two circles should overlap each other. Assign a title to each circle that represents each idea you are comparing. In the overlapping area, write all of the things that the two ideas, people, or objects have in common. These will be what you refer to when you are comparing these ideas in the essay. In the areas that are not overlapping, write all of the differences, or contrasts, between the two ideas, objects, or people. 1. Both turtles and cats make good pets. a. Both of these animals are entertaining. b. Both animals are relatively easy to care for. c. Both animals are inexpensive to adopt and to care for. 2. Both turtles and cats have drawbacks. a. Both animals will need to have a cage (turtles) or a litter box (cats) that needs to be cleaned. b. Both animals require attention and time. c. Both animals can be costly in terms of veterinary care. a. They can feed themselves as long as their food bowl remains filled. b. Cats can be left alone for a day or two. 4. Turtles are less messy. a. Turtles live in an aquarium. b. Turtles do not need a litter box. Introduction and Thesis Statement (one paragraph). Topic One (at least one paragraph, can be more, discussing just one of the ideas, people, or objects being discussed in great detail). Topic Two (will follow the same guidelines as topic one). Topic One and Topic Two Together (analyze both topics together, can be one or more paragraphs). Conclusion (sum up the compare and contrast essay, should generalize the thesis and should reaffirm the thesis). The first paragraph of the essay will be an introductory paragraph. It will also include the essay’s thesis statement. The first paragraph should present the first comparison from the Venn diagram, the second paragraph should present the second comparison from the Venn diagram, and the third paragraph should present the third comparison from the Venn diagram. 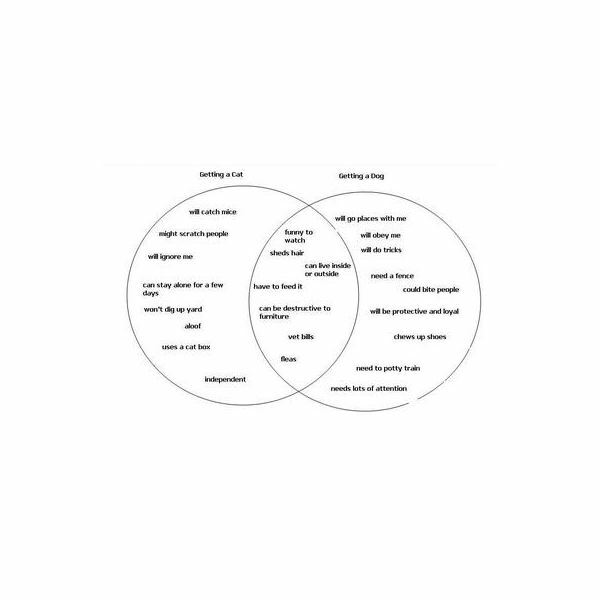 If there are more comparisons on the Venn diagram, more paragraphs can be added. The fourth paragraph should present the first contrast from the Venn diagram. The fifth paragraph should present the second contrast from the Venn diagram. The sixth paragraph should present the third contrast from the Venn diagram. Like the comparison, more contrast paragraphs can be added. The eighth paragraph should present the comparisons and contrasts together. The ninth paragraph should present the conclusion, generalization of the thesis, and reaffirmation of the thesis. The Venn diagram should ideally contain three comparisons and three contrasts. However, it must contain at least two comparisons and two contrasts. When drawing the Venn diagram, the circles should be very large, so that all information fits within them and within their overlap. Once all of the information is written within the Venn diagram, it is a good idea to make each circle a different color, as well as the overlap area. Using three colors to “separate" the information makes a Venn diagram easier to read.